Yes, something salty for once! I admit that I could bake (or eat) cake all day but I also enjoy a nice salad. 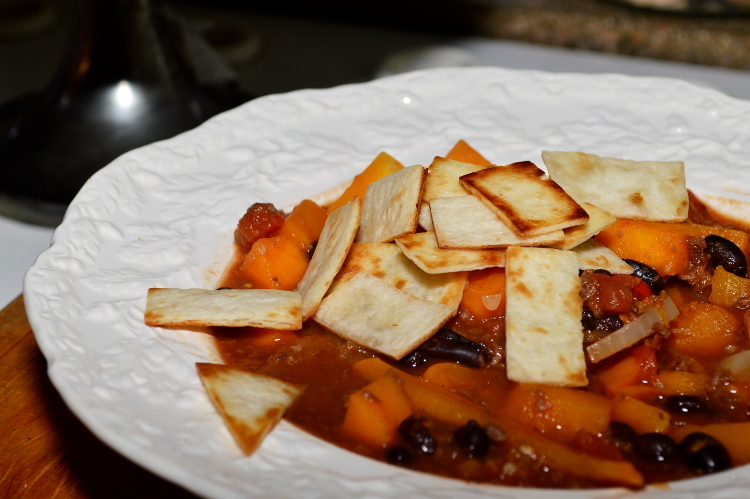 We make this one quite often since it’s so delicious and fast to prepare. Quinoa became one of my favourite ingredients for a lot of dishes like lentil dhal or veggie patties. Unfortunately it’s quite expensive in here. But have a look at the recipe or lets say at the ingredients since I rarely measure things. Boil the pasta al dente and rinse under cold water. You can boil the quinoa at the same time in a second pot. It will take around 10 minutes. Also rinse the quinoa with cold water afterwards. Fry some sunflower seeds in a pan without oil until they get some colour. Let them cool down a bit on a plate. If you leave them in the hot pan they will burn easily. Wash and chop the lettuce. 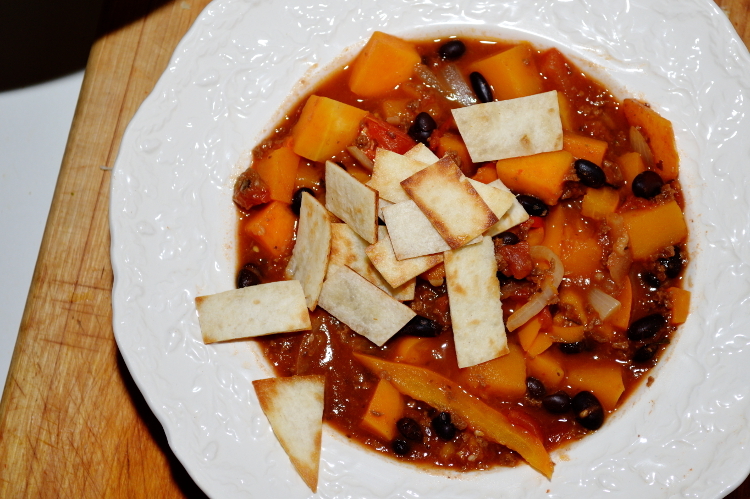 Take the seeds out of the chili and either chop it really small or leave it in rings. You might want to taste it before. If you got a mild one you can put the whole chili in but it really depends on how hot you like it and what kind of salad dressing you will use. 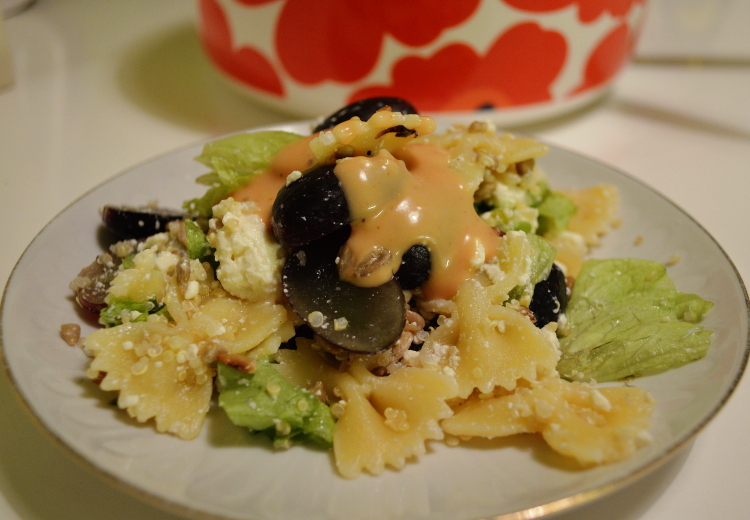 I like to put a chili-lemon dressing over it and therefore leave the chili out of the salad. 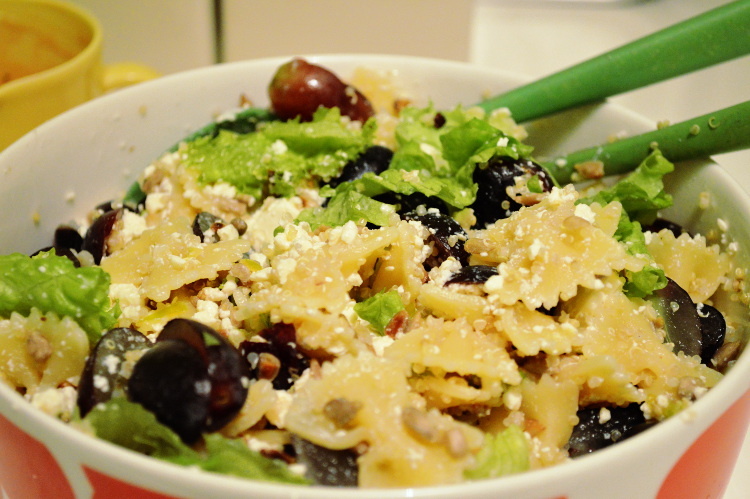 Cut the grapes into halves and crumble the feta with your hands. 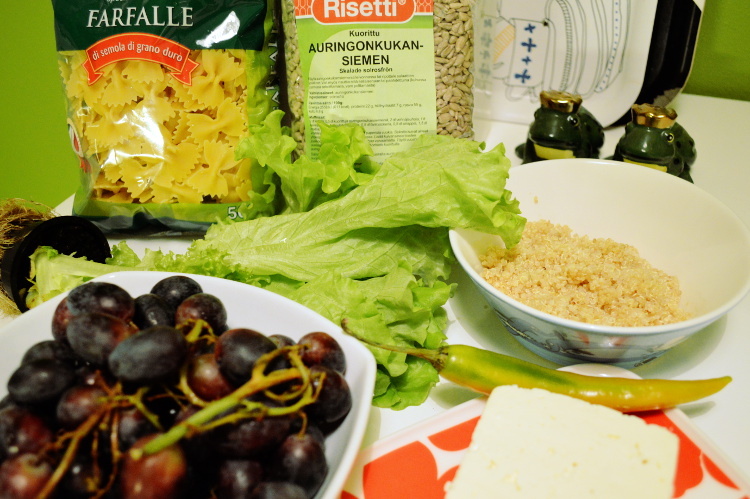 Add the pasta, the quinoa and the sunflower seeds and mix everything up. You can use any kind of dressing you like. I usually use one of the following. They both will stay good for a while if you want to make a larger portion. It’s best to prepare this dressing in a jar or something you can close, so it can be shaken before serving. Add olive oil to the juice according to taste. I always use a bit more oil than juice. Crush 2 garlic gloves into the jar and add chopped chili to it. Spice with salt, pepper and a little bit of sugar. 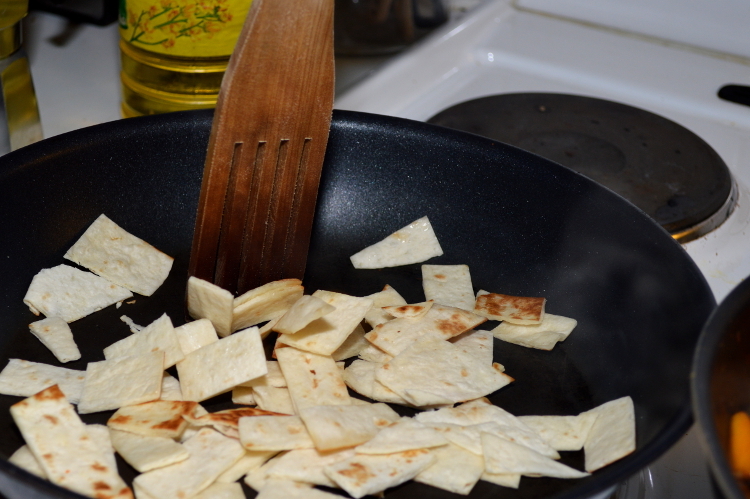 You can also fry the chili and the garlic in a little bit of oil before adding it to the dressing. Add a little bit of tomato paste (or ketchup) to the mayo and mix it up. It should be a light red. Then add some crushed garlic, soy sauce and pepper. Since the dressing will be quite thick, add some water until it’s thin enough and add more soy/pepper to taste. 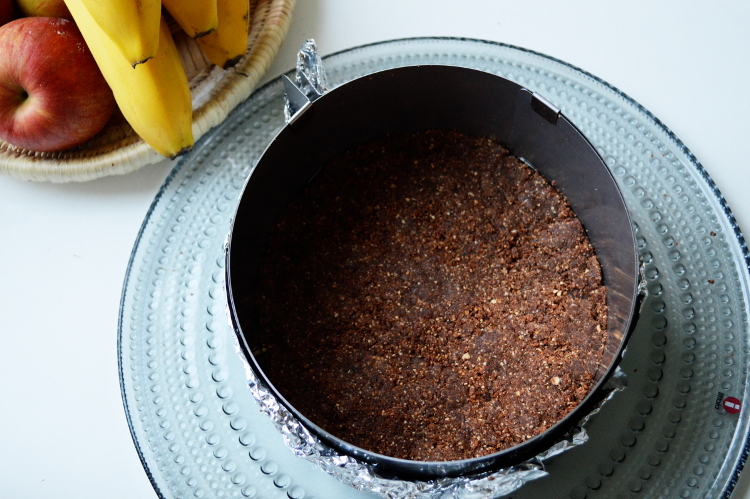 Since Tiia and I ate raw cake in a café, I really wanted to make one myself. There are lots of recipes on the internet but they didn’t quite suit what I was looking for. In the end I decided to come up with my own. Food is considered raw if it hasn’t been heated over 40-46°C. 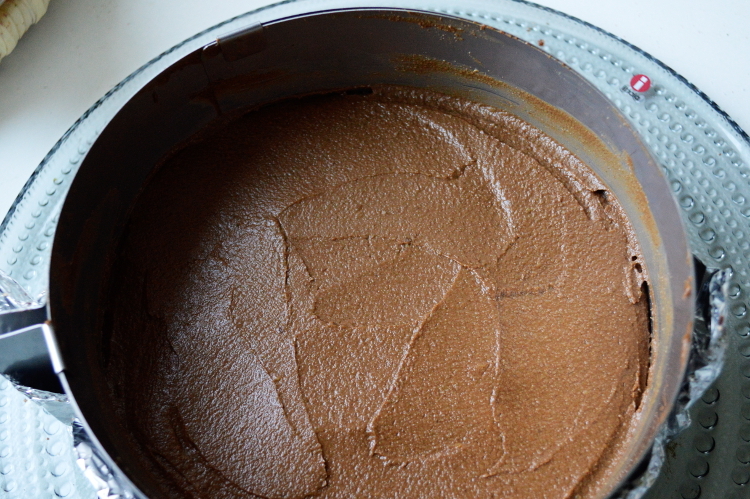 Raw cacao powder is supposed to have a lot of antioxidants and magnesium for example. That would be certainly a nice side effect. 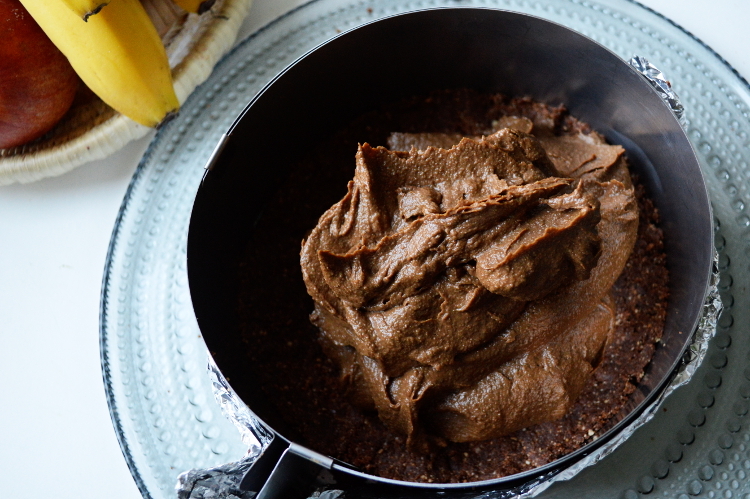 No matter what: it tastes way better than the usual cocoa powder used for baking. The cacao powder already smells strongly like chocolate. First of all I wanted to recreate what we had tasted in the café since raw cakes or actually any cake don’t come cheaply. The last one we bought was 6.50€ per piece. I also like to try out new things. 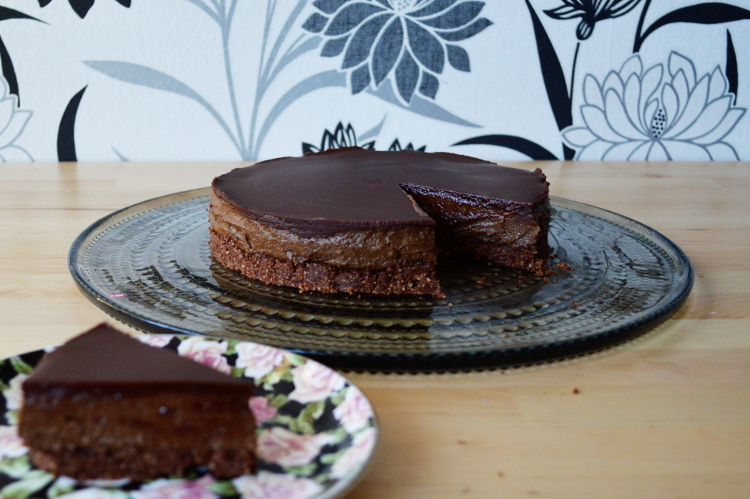 So vegan, gluten-free baking is certainly new to me but I like challenges! 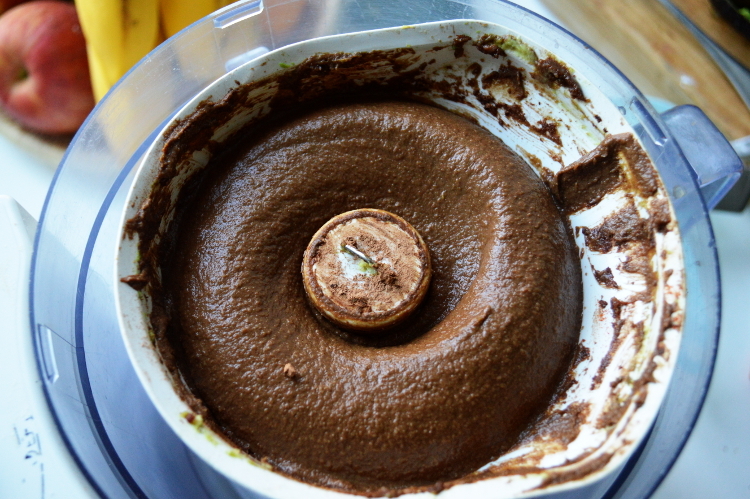 Blend all the ingredients in a food processor and scrape down the sides from time to time. It should be ready when the mixture sticks together by itself. For making the crust I used a cake ring and adjusted it on the smallest setting which was around 17 cm. I put it on a cake plate and wrapped aluminium foil around it which wasn’t really necessary in the end. Just spread the mixture with your fingers or a spoon and press it down firmly. Put it in the fridge for the next step so it can set. I put it on the balcony since there is never enough space in the fridge and it’s certainly cold enough outside at the moment! The coconut oil is usually firm in room temperature (depending on where you live) so I had to melt it first. Be careful just to heat it slowly, otherwise it won’t be raw anymore! 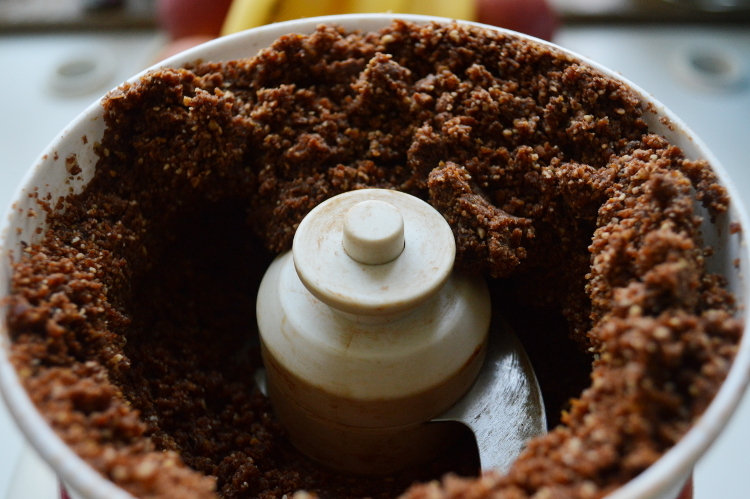 Afterwards blend everything in a food processor until it’s really smooth. That will take a few minutes. Add a little salt to taste; it takes away the bitterness of the chocolate. 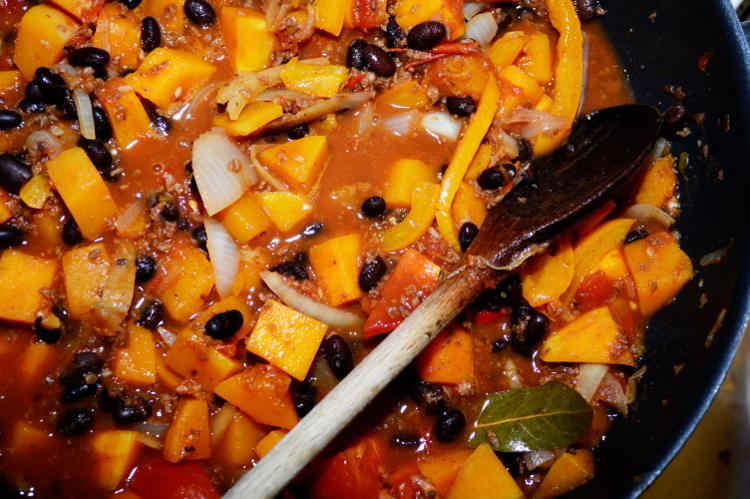 You then can add some chili step by step. Be really careful with the amounts. If you don’t like chili in your chocolate you can, of course, leave it out and put some vanilla bean in. 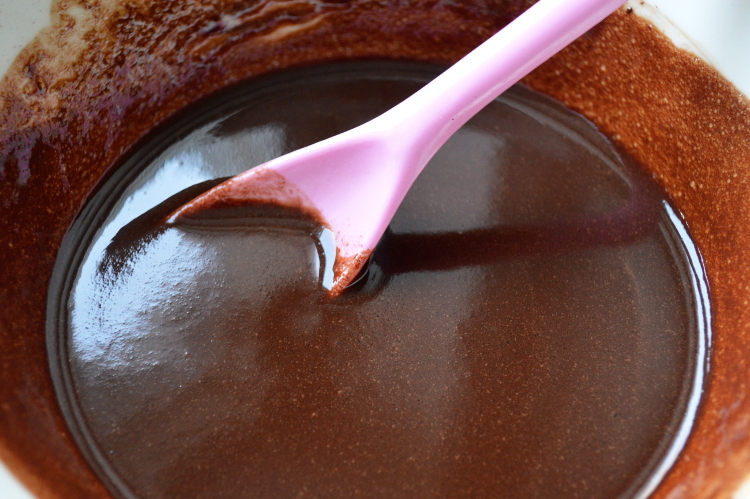 When the mixture is done it will be really fluffy like chocolate mousse. Pour it on top of the crust and spread it evenly. Put it back in the fridge. 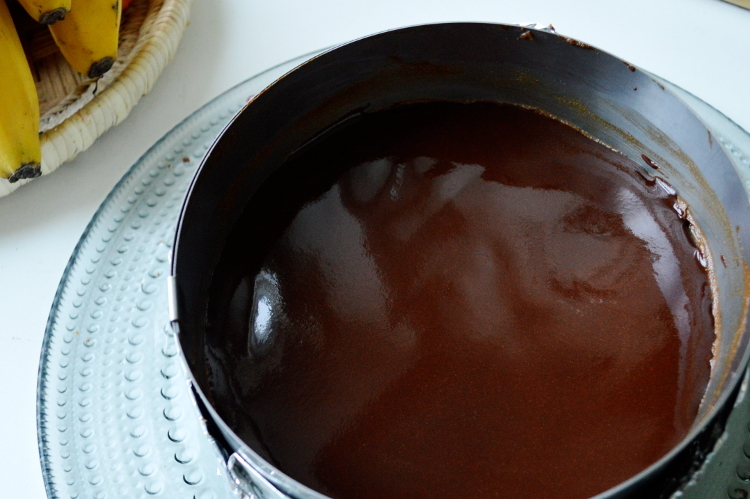 Warm the agave nectar in a hot water bath. Be careful with the temperature again and don’t heat it over 40°C. Add the cacao butter and let it melt. Then add the cacao powder and some salt. I love slightly salted chocolate , so I always use a little bit more. Take it out of the water bath and stir until everything is mixed. Let the topping cool down a bit and then pour it on top of the cake. Put it back in the fridge for at least 15 minutes until the frosting has set. If you leave it in there for a few hours before serving, make sure to take it out a bit earlier. 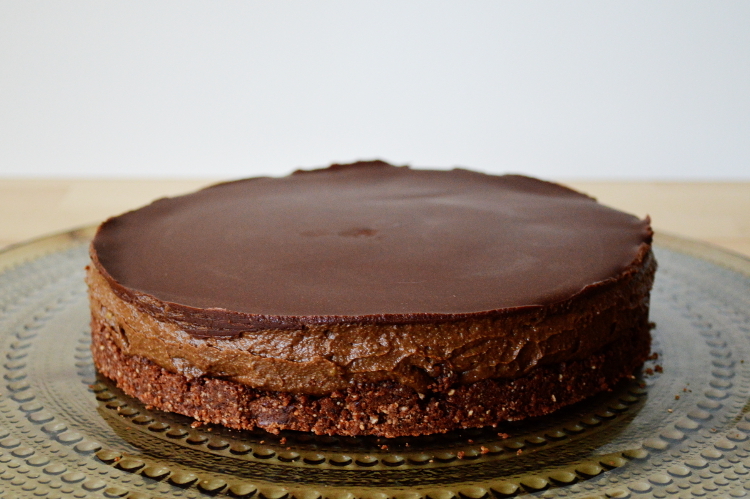 The topping shouldn’t be too firm, otherwise you will have problems cutting it. The easiest way to do that is to use a hot knife. The chocolate top won’t break then. I hope you’ll enjoy this delicious cake as much as we did!